This beauty is a river-based tide lock! 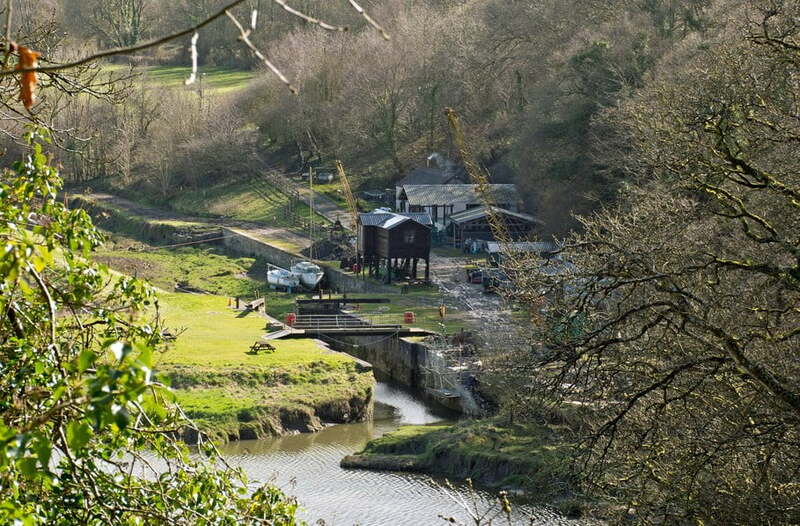 It formed one end of Lord Rolle’s impressive canal in North Devon, on the River Torridge. To gain entrance to Lord Rolle’s Canal, vessels had to negotiate their way up the River Torridge and sail through the Tide Lock. Their journey then continued in special boats with wheels on so that they could be pulled up a steep incline to the higher level of the actual canal. All of this was devised by the Devon Engineer, James Green. ‘This one is often refered to a ‘Sea Lock’, but the open sea is approximately 11 miles away by river and approximately 4 miles inland by road from the riverside port of Bideford. It is, more accurately, a tidal lock chamber. There is a true sea lock on the Bude Canal which was completed in 1825 by the same engineer, James Green. The Rolle Canal Sea ock is slightly smaller than the one at Bude; between the outer and inner gates the chamber is 71 feet long and 20 feet wide. The outer gates would have been approximately 24 feet high and 13 feet 6 inches wide. The inner gates would have measured approximately 16 feet by 13feet 6 inches. The lock chamber opened into a wharf area of quite considerable size. The larger river-going vessels, about the size of Severn Trows, would transfer their loads of lime stone and anthracite here onto smaller barges called ‘tub boats’. Tub boats were usually towed by horse in ‘strings’ or ‘trains’ of six. Each string was controlled by a single man, whose responsibility was to ensure the boats did not stave into the banks, and a boy, who led the horse. The first tub boat in a string had a pointed prow but the others were no more than simple rectangular boxes, measuring 20 feet long and 5 feet 6inches wide. Their loaded draft was only 20 inches. Each tub boat was capable of carrying loads of approximately 4 tons. As well as the large wharf for trans-shipping cargo at the sea lock there was also a shipyard, the exact location of which is unclear. This shipyard had originally been sited by Annery Kiln but was moved downstream when Halfpenny (Ha’penny) Bridge was built in 1835. John, Lord Rolle and William Tardrew, amongst other landowners, all with financial interests in the lime trade, put forward the funds to erect this bridge in order to make better communication between Bideford and Great Torrington. The lime burning industry ws hiuge around here and kilns were erected on both side of the River Torridge. The shipyard at Sea lock built a number of substantial vessels. In 1829 the ‘Lord Rolle’ (105/98 tonnage) a brigantine was built here and in 1869 the ‘Sedwell Jane’, a much larger brigantine of 201 tons was constructed at this yard. Between these dates several lighters, brigs and polaccas were built, all bearing the names of Rolle estates and properties. Now the site is privately owned, but by a most knowledgeable custodians. They are restoring the Sea Lock and thank fully, we are able to view the area from above, thanks to a viewing platform and infomation board situated on the Tarka Trail. Check out the website about the Rolle Canal – HERE! The Rolle Canal later became a train line and now a cycle route called the Tarka Trail. Lots of industrial remains to be seen along this line – everything from aquaducts turned into viaducts, train stations, tunnels, bridges, embankmants, the occcasional wrought iron lattice river bridge and limekilns!